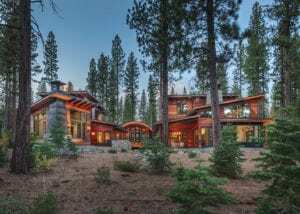 Walking through this Martis Camp home’s front door, it is immediately apparent the house was built to be enjoyed by multiple families. Mark Neave of Truckee’s NSM Construction shared a vision with the owners—a San Francisco–based development group called Strongbow Partners—of a space for three active families to enjoy being together as a group with space to escape as individuals. 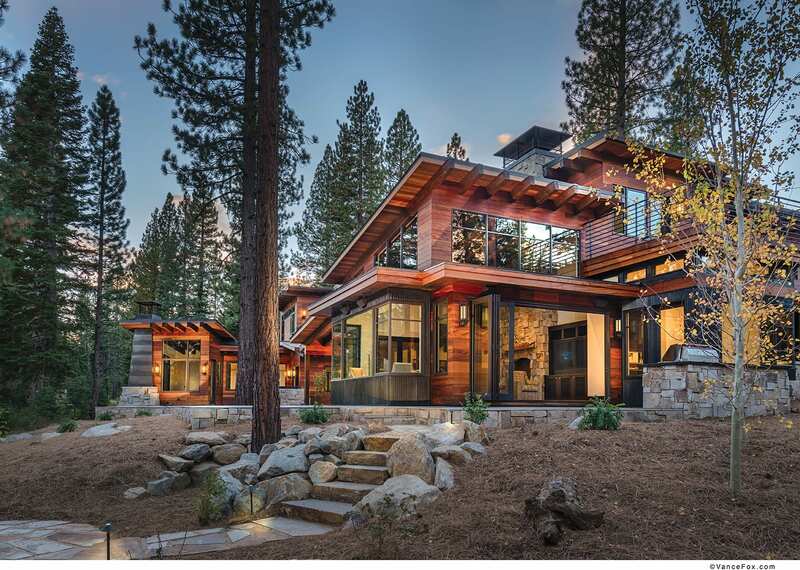 Scott Gillespie, principal at Tahoe City’s SANDBOX Studios, undertook design midway through the project after the owners and the original architect parted ways. The large glass entrance surrounded on either side by curved trim windows reflects similar windows on the other side of the European oak-floored hallway. The entryway is raised above a dry river bed, creating a bridged area. The exterior is finished in a deep Brazilian hardwood, with horizontal boards complementing a flat-roofed system. The entryway’s focus on the landscape reflects the owners’ shared love for the outdoors. Avid paddleboarders, bikers and hikers, the three families wanted a large backyard to enjoy outdoor activities together. The 7,012 square foot home is built in the shape of an “H,” split into two wings connected by the arched entryway. To the right is where the magic in this home happens—a space that lets the kids be kids and the adults exercise their inner child. The large, communal space features a PGA-approved indoor golf simulator for the owners to practice their swing when there’s snow on the ground. The room also hosts a half circle-shaped, fully functional bar and lounge area, complete with a pool table for the sharks. An adjacent “healing” room features natural, therapeutic colors and a professional massage table (several of the owners are trained massage therapists). From there, a connection to a dry sauna made of Russian red cedar puts the cherry atop this homage to at-home health. Beyond the recreation area is the master bedroom with a large stone fireplace—expressed on the exterior in hot-rolled steel—and easy access to the backyard communal areas. A pair of guest suites are situated on the wing’s top floor, a walk-out deck overlooks the yard. The home’s other wing, just down a short staircase from the entryway, opens into a spacious kitchen with an L-shaped island perched atop a steel base. An overflow breakfast nook maintains backyard views. Adjacent to the kitchen, beyond a double-sided stone fireplace, is a well-appointed living room with plenty of space for all three families to enjoy each other’s company. The living room features bi-fold doors opening to the backyard. This room captures optimal sun exposure—keeping it warm and well lit during the winter—as well as views of ski runs at Northstar California. The children’s suite is on the wing’s second floor. Atop the stairwell, a full-sized media room features a ceiling-to-floor movie screen. The stadium-style room includes lighted stairs with bean bags and couches on each level. For a getaway with places for everyone to play—and relax—the home has it all.